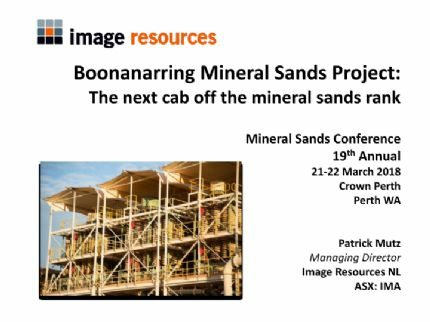 Image Resources Ltd (ASX:IMA) (OTCMKTS:IMREF) is an emerging Mineral Sands producer focused on the development of its high-grade Boonanarring Project in the North Perth Basin while continuing to expand its resources and reserves base. 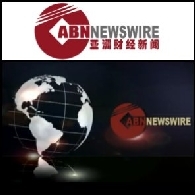 تضم متابعة وكالة الأنباء إيه بي إن للأسهم اليوم كلاً من: Focus Minerals Limited ASX:FML و Australian Bauxite Limited ASX:ABZ و Image Resources ASX:IMA PINK:IMREF و Coalspur Mines Limited ASX:CPL PINK:CSPZF و FerrAus Limited ASX:FRS PINK:FRRAF. 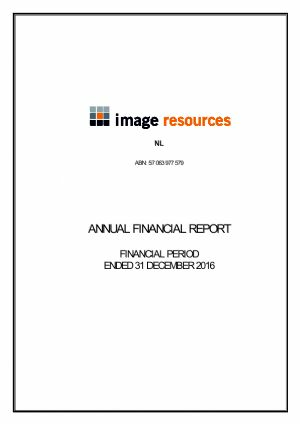 تضم متابعة وكالة الأنباء إيه بي إن الأسهم لليوم كلاَ من: Image Resources ASX:IMA PINK:IMREF وCarbon Energy Limited ASX:CNX PINK:CNXAF و Kingsrose Mining Limited ASX:KRM و Bandanna Energy Limited ASX:BND.